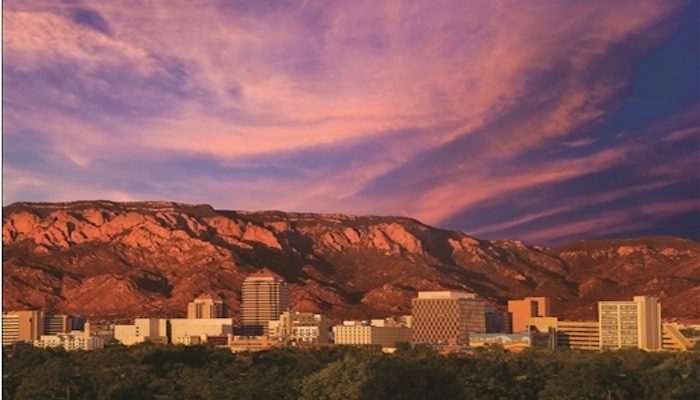 While not the capital of New Mexico, Albuquerque is the Zia State’s biggest city. The desert metropolis has a population of just over 500,000 and at 200 square miles within the city proper, is very spread out. The city is framed by the Rio Grande River downtown, and the gorgeous Sandia mountains to the east, where timing some runs to enjoy the unique colors of desert mountains can be a special treat. Note that downtown Albuquerque sits at about 5,200 feet: like Denver or Salt Lake City, running at altitude is a particular running challenge, or training opportunity, depending on your perspective. 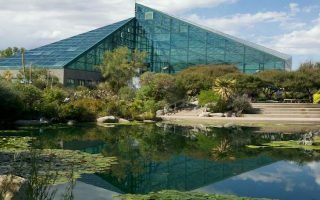 Our guide to running in Albuquerque features a combination of centrally located running paths, cool neighborhoods, and accessible trail running. The centerpiece of downtown Albuquerque running is the 16 miles of trails along the Rio Grande River. We’ve also included some of the more accessible and pretty runs in the Sandia Mountains, where there are some 150 miles of trails to hike, run and explore. There’s also some nice running near the University of New Mexico. 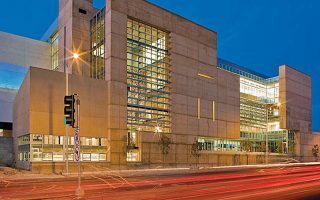 Albuquerque has recently hosted the NCAA Indoor DI and DII National Championships for collegiate competitions and the USATF Indoor Track and Field Championships for elites at the indoor track facility at the Convention Center. Albuquerque has no subway, but does have an extensive bus system that takes passengers throughout the city. ABQ RIDE offers a free ride for those flying into Sunport International Airport to Downtown. The Route 66 line takes passengers up and down famous Route 66 through Downtown, up to the University of New Mexico, the trendy Nob Hill neighborhood and beyond to The Heights. The signature place to run in the center of Albuquerque. 16+ mile paved path with 5 mile side path. Views of the river some of the way. Some sections pleasantly shaded. See our table for segment distances. 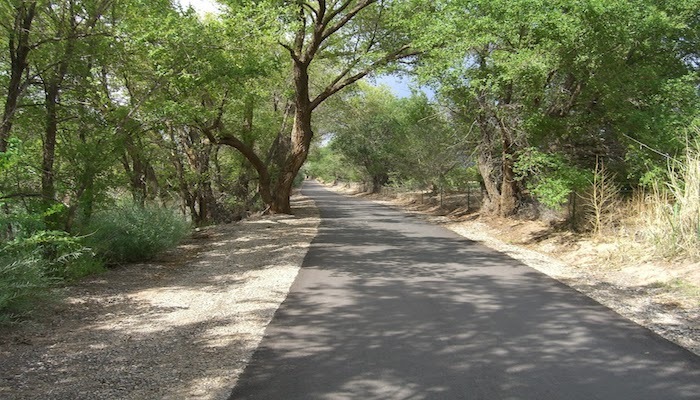 A lovely route branching off the Rio Grande bike trail. A soft surface loop within the Bosque nature center provides great views of the wildlife and the Rio Grande. Popular with runners. 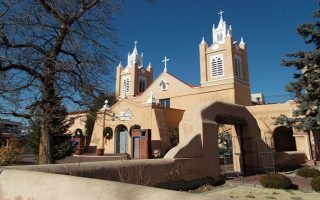 A run through Old Town (the old Spanish colonial town) is a great way to experience some of Albuquerque’s history. Enjoy as a standalone run or add on with some of the Rio Grande pathway sections. A wonderful taste of trail running in the Sandia Mountains. 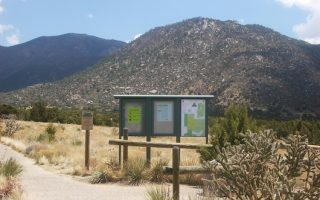 Our loop takes you to the top of Bear Canyon before the entrance into the Sandia Mountain trails at the Spain Trailhead. There are wonderful opportunities to run and explore some of the foothills and mountains just east of Albuquerque. 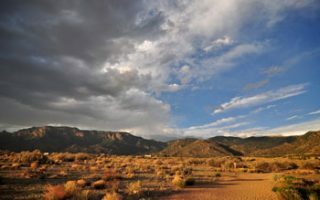 The Sandia Hills Open Space offers something for every runner -- we've mapped a 4-mile bike trail and the famed 365 Trail. 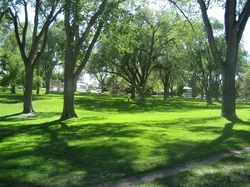 The University of New Mexico campus, 2 miles east of downtown, is a popular place running spot. A half mile cinder trail around the perimeter of the grass field with the Sandias providing a beautiful backdrop, especially in the evening. Located adjacent to the Sunport International Airport, Bullhead Park is a great option for an easy run. Surrounded by sidewalks, dirt paths, grass fields. The Copper Trailhead is a great option if you’d like a technical and hilly trail near the city. Panoramic views, the abundant cacti, winding trails. NOTE: 1200 foot elevation gain! 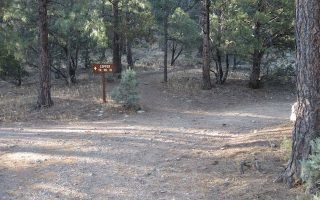 Albuquerque’s altitude, year round moderate weather, and great trails make this area a popular place for elite runners to train. This is where some of the world’s best, among them Paula Radcliffe and Hicham El-Guerrouj, have trained. 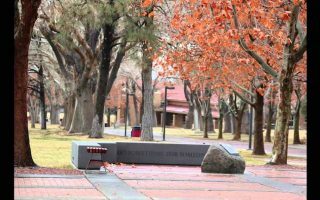 With its dry climate of moderate winters, and pleasant fall and spring temperatures, Albuquerque is among the more runner-friendly weather spots in the U.S. The summer months of May through August do produce some days over 100 °F and the sun will feel stronger to those visiting from lower elevations. Wearing sunblock and running early in the morning or in early evening is recommended. Because of its location in the desert, the weather is arid and dry, yet July can feature a mini monsoon season with heavy rainfall. 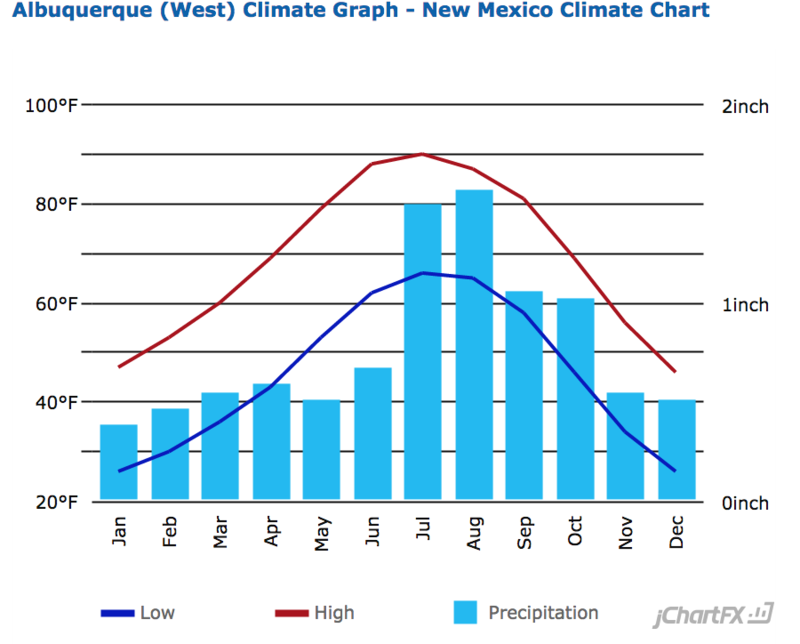 Additionally, for those coming into The Land of Enchantment (as the city is known) for skiing, December produces the highest snowfall. Yet again, with the strong sun and dry climate most, snow melts within the city quickly. Winter are cool to cold and dry, with highs averaging in the 40s and lows dropping off into the teens — so if in Albuquerque in the winter, pack extra layers and be prepared for occasional ice/snow. Your best bet for staying near good routes in Albuquerque is to stay in the hotels in or near downtown. There is a good cluster just to the west of I-25, between 2nd St. SW and 8th St. SW, and along Central Ave., stretching to West Old Town. 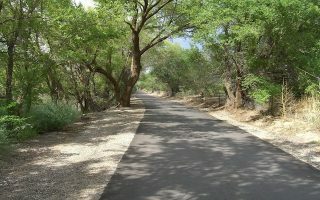 Here, you’ll be within 1/2 mile of the Rio Grande trail. There are many upscale hotels located in Old Town. Additionally, there are many hotels and motels located near the University of New Mexico and further up Central Ave, part of historic Route 66. For easy freeway access, there are lots of hotels along I-40, but they are less proximal to good running routes. Heart and Sole Sports has been serving the runners of Albuquerque for the last 25 years. The owner, Stan Hockerson, has developed some of concepts and technology for over 67 shoe brands. With a treadmill at both their locations, the staff will film your running gait to suit you in the best shoe appropriate to your form. With two locations in the Northeast Heights, the stores have a great selection of footwear, as well as many local runners happy to recommend running help. Albuquerque Road Runners Information on running in town and throughout New Mexico, including a race calendar. La Luz Trail Run A lottery entry trail race with over 10,000 runners climbing to over 10,000 feet. One of the most prestigious trail races in the US. Duke City Marathon Marathon, marathon relay, half marathon, 10k and 5k run serving runners of all abilities. Boston Marathon qualifier drawing the biggest crowd of runners in New Mexico every year. USATF Indoor Track and Field Championships Hosting the elite runners for the 2017 National Championships.